There is a great community of knowledge and friendliness emerging around the electric car world as public charging points have become places of warm discussion, helped no doubt by the good weather. This new community of sharing was so evident when I took the new Nissan Leaf on my usual lengthy test drives. Everywhere I stopped for a charging boost I met either other Leaf drivers or people who were fascinated by the electric car concept. And I learned so much about the car that I was driving, mainly from existing Leaf owners, all of whom were delighted to enthusiastically share their electric car driving experiences. And not a bad word among them. After over 1,000km of driving, not your typical electric car driving profile, I have developed a new confidence in the car. 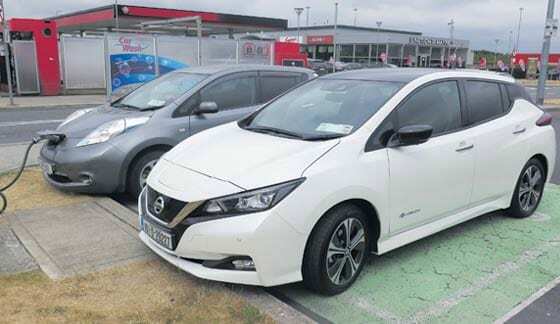 Driving an electric car in Ireland is about changing your mindset; you need to plan your journeys with charging at the other end or in between, always in mind. My journeys to Cork, Portlaoise and Kells, Co Meath all required strategic planning. Fast charging and top charging gives you new opportunities to become a coffee expert and I found I quickly created work opportunities during these charging intervals. The charging network still needs more work, while the ESB app to locate the charging points is good, there are not enough of them out there. The Nissan Leaf electric car is great, but the network lets you down a little. Even with careful planning and while you can travel the country comfortably, the range anxiety still takes some time to ease, and it will as you become better at planning your journeys. This Leaf is a very impressive car. 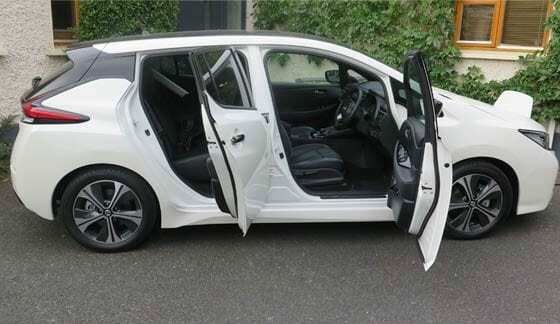 Firstly, it’s an attractive new car, with real car looks, a car that you would be proud to own. On the inside, the Leaf comes with an improved 7 inch, full-colour (TFT) display to highlight key features, including information from the audio and navigation systems. The standard navigation features also includes real-time information on the nearest charge points of which there are not enough, just yet. Apple CarPlay and Android Auto are also available through the system. The car has its own app to allow drivers to remotely get information about the charging level of the car. It also allows you to adjust the climate control while the car is being charged, saving battery capacity, so that on these warm days it is possible to have your car cooled down in advance of returning to it, after a day at the seaside. The car’s performance has also been significantly improved as the new electric drive system delivers 150bhp (110kW) of power and 320Nm of torque, a match for most cars in this size category. With this comes improved acceleration performance where you get a 7.9 second from 0 to 100 km/hr acceleration, making this is the fastest car to accelerate in the c-segment of the market where the Volkswagen Golf and Ford Focus dominate the sales. The new Leaf is the first electric vehicle to undergo Worldwide Harmonised Light Vehicle Testing Procedure (WLTP) and delivers a range of up to 378 kilometres on the Combined Cycle, or higher in city conditions, on a single charge. This is claimed to be a 50% increase over the previous generation Leaf. The WLTP test is designed to reflect real life situations more accurately. 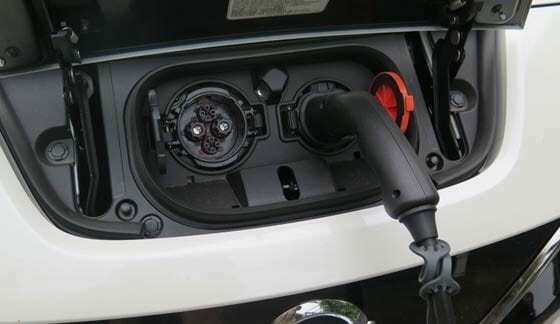 This means that you can enjoy longer journeys, by using the interconnected by the extended European CHAdeMO Quick-Charging network which is well catered for on the Irish motorway network. Charging time from alert to 80% (quick charging – 50kw) takes 40 to 60 minutes at one of the stops, while it’s around 7.5 hours from alert to 100% with a 7Kw wall box, one of which I have at home. Longer driving demands that you use the car’s adaptive cruise control to maximise its efficiency. I quickly came to terms with the new Nissan Leaf’s revolutionary e-Pedal technology. This allows acceleration, deceleration and full stop with the simple increase or decrease of the pressure applied to the accelerator. With a deceleration rate of up to 0.2G, the e-Pedal eliminates the need for drivers to constantly move their foot from the accelerator to the brake pedal to slow down or stop. I found that this helps reduce fatigue and stress in daily city driving, and it meant that I was using the brake pedal way less than I would in a conventional car. The entry prices start at €28,690 after the Government grant of €5,000. 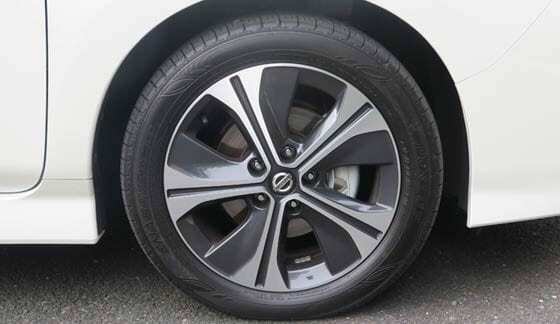 This is a real car with good comfort, great handling and a decent boot. Running costs are minimal as public charging remains free and an overnight home charge is rated to cost you not more than €3. So it was safe to say that my 1,000km driving week cost me less than €20. Do you need any more convincing?